So, it’s now the start of March and there’s no sign of spring yet! I don’t know about you but for me it feels like the ice age and there’s no end to it. Better get used to it I suppose. With the fields being an unending sea of mud ensuring your imprisonment in the arena for the foreseeable future, the hopes of getting to jump a full course in preparation for the upcoming competition season is slim to non-existent, unless you’re lucky enough to have a competition size arena. This is the perfect time to refine your equine gymnastics. I’m very lucky to have access to an indoor arena where I am. However, it is on the small side but still better than being outside in the rain or sleet and god knows what else! 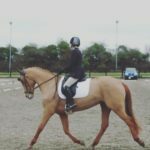 With space being on the tight side here’s my top showjumping exercises to make the most of a small arena. All of these will work in a 20m X 40m (tried and tested). One of my new favorite equine gymnastics exercises is a simple one. Recently I got a four-year-old who is set to be an eventer and he struggled with maintaining a rhythm into jumps. So, I put a cross pole at B and E with trot poles on the approach. One for the right rein and one for the left rein, this way there’s no need to get off to swap round. Don’t forget to leave room for takeoff! Depending on your horse’s size they’ll need three or four yards from the base of the jump to the last trot pole. You can make this as complicated or and easy as you like. To challenge your horse, see how many poles you can fit in (I managed five with the baby), you can also raise them up to. This will really get them using their backs. My Top Tip: Raise poles up using plastic potties! I’m serious! They’re cheaper, lighter and even stackable. You might look a fool carrying them around, but you’ll soon be the one laughing, I promise. So bulk buy potties!! Have you a horse that rushes, doesn’t pay attention or gets flat? Well then this is the one for you! 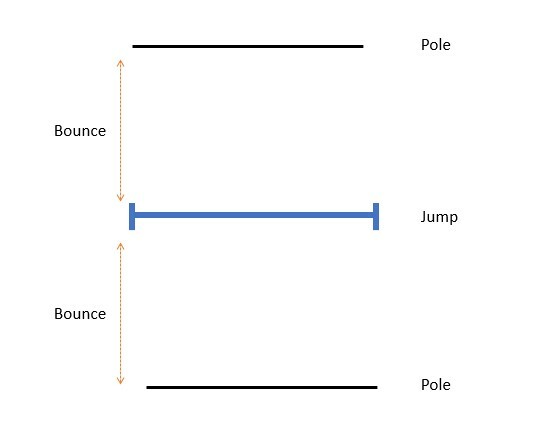 It consists of a placing pole before and after a jump. This is great for just getting them to hesitate enough to make the correct bascule shape over the jump, no matter how experienced or inexperienced your horse is. Again, I’ve done this with the baby and the more experienced ones. For the first time or with inexperienced horses to build up confidence, I’d recommend four yards between the poles and jump. But this can be varied depending on what distance your horse is comfortable at. For the more experienced horses you can shorten or lengthen the distances to challenge them a little more or even have the poles raised. If your horse is inclined to rush I’d keep it on the short side. Be prepared for it to take a few attempts before they realize that rushing makes it very difficult for them. Don’t you worry about the pole on the landing side, your job is to get to the first pole and theirs to jump the jump and get over the landing side pole. Try not to help your horse out too much, they need to think for themselves sometimes. You can’t always do everything and there’s not much you can do in the air anyways. You can stay as low or go as high with the jump as you want. Just make sure they have adequate space to take off and land. You don’t want to make it impossible for them. There’s great scope with this exercise as you can add as many poles as you want. Or add these poles into your normal grid exercise to spice things up a little. Another favorite equine gymnastics exercises of mine, is to place three jumps down the center line at G, X and D all facing the long side. You can also place four jumps on the center, with a jump on the track but I like to keep the track clear for going large. This exercise is great for getting your horse used to the concept of changing legs or flying changes. This can also be used with just poles or cavalettis its up to you. 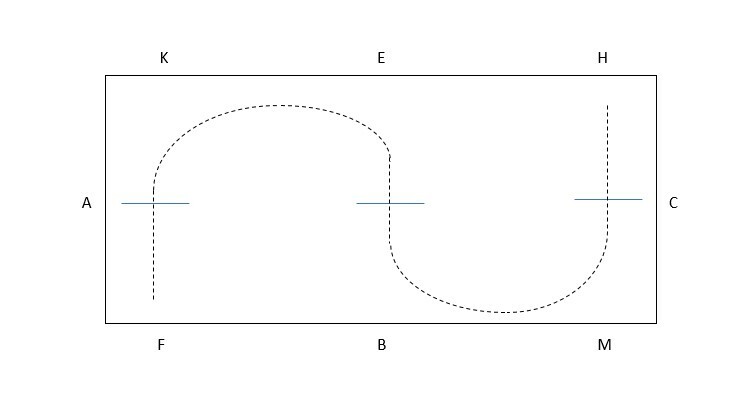 The idea is to start at one end of the arena and ride the serpentine movement, you can go up and down the serpentine movement as much as you or as little as you want whilst getting the lead changes. Suppleness is key in this one. So, don’t worry if it’s a little challenging to start with, you can always ride a circle between each fence and work your way to riding the full serpentine movement. After doing this a few times suddenly that serpentine in your dressage test seems a whole lot easier! So, they’re my top three equine gymnastics exercises for improving your performance whilst making the most of limited space. I don’t know about you but I’m definitely doing some sort of sun dance. I need the eventing season to start soon. The withdrawals are starting to get too much!